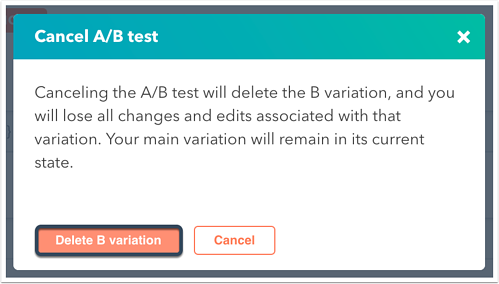 In an A/B test landing page or website page, only the B variation can be deleted. In the pages dashboard, hover over your A/B test page and click Edit. Click the B icon in the upper left of the page editor. Click the Settings tab, then click Delete variation at the upper right. In the dialog box that appears, click Delete B variation. Once the B variation has been deleted, the page editor will refresh to reflect the main variation.